Now the article is free, you can entirely copy provided you cite the author and put a link. Boom Direct created the event this year by becoming the first advertising network to shared revenues francophone no clicks. Already tens of thousands of members and even English is put. The concept is simple, 20% of the investments by members are available to business web advertising partners of BoomDirect. Boom Direct creates campaigns of professional marketing, Youtube Ads, Facebook, Google Adwords, Adsense etc… In short everything goes (ed. google adwords and google adsense are opposites anyway, so this shouldn't be together) in Exchange for advertising business partners share their profits with BoomDirect that redistributes more than 80% of these profits to members in the form of virtual shares. The first advertisers partners are software H & R Block (specialized in taxation), Kaspersky (antivirus) and Cashadvance (U.S. transfer of cash type Western union). They are also more found in the partner section. 0.2.1 Officially, how is the system of direct boom? 1.1.2 A system based on growth. 1.1.5 Getting paid to almost do nothing? 1.1.6 And just after we must learn to traider? 1.1.12 No serious payment system. 1.1.17 A record in a tax haven ex address. 1.1.18 Of the imprint probably not legal. 1.1.20 Did you actually understand the economic model? 1.1.21 I did not have official confirmation of serious partners. 1.1.30 Inconsistencies in the funding system itself! 1.3.7 An intermediary not authorised is subject to criminal penalties. Sponsorship program optional on 4 levels (10% for direct referrals to 2% for all 4th level referrals). You are not all required (e) sponsor, but if you do you will then earn a percentage of the earnings of your referrals and referrals of your referrals, on 4 levels. This can be very interesting, as you increase your envelope. Minimum purchase: 2 coupons, maximum: 1200 coupons. The minimum to invest back in boomdirect is $ 50. After nothing prevents you to further develop. With the rank of positioning, BoomDirect offers the possibility to increase your monthly revenue and better function in society. These rows represent your interest in the business! There are a total of 10 rows of positioning, ranging from BRONZE to legend! Higher your rank, the more you receive significant monthly commissions, as well as potential customers (downline) you will be provided! For a limited time, all new members will receive the BRONZE rank free! Will you become the next legend? The coupons are paid every week and generate added value by 40% (purchase $ 25 unit, pay $ 35). From there you know that it is a scam. According to my information it € 7.9 for a pack of 50 to life, performance is not all the same. Currently observed weekly performance of the coupons is 6% or 312% annual. Here, no clicks to be paid. It is very significant, especially if it is already registered in other opportunities where you must click every day or every week. Starting in 2016 the coupons system will therefore leave place for ranks or levels of qualification that will be reduced to 10. Skill levels range from "bronze" status to the status "caption". As shown in the table below with 40000 members, approximate monthly earnings for a "bronze" is $ 7.90 for a "Platinum" $ 118.53, for a "caption" $ 9482.04. With 200,000 members annuities are even greater. The old coupons will they be lost? should we give them money to restart the Ponzi scheme? I do not know. The goal is to pass 40000 members 200000, see more. The reason is evident in the above table. For those who are already members, depending on the number of coupons is determined after a simple calculation, their level of qualification. So you'll $ 2520 principal that matches the rank "star" on the above table. Your pension will be $ 553 per month. This remuneration is paid to your account instantly upon registration of your downline. These percentages apply on all advertising coupons purchased by your referrals as well as all their reinvestments! So you are going to touch money on everything that your genealogy purchases or reinvested, and this on 4 levels deep. Officially, how is the system of direct boom? Here comes the partnership, on each open position the boomdirect trader opens positions to €50 which always begin in negative at €-4 which is the tradeo. The purpose of the trader is therefore simply to bring this position to 0 or in slight gain. On each boomdirect 40% Commission of tradeo key positions, the work of the trader is to open 2 positions by days so boomdirect key € 1.6 / position / Member/days on an average of 20 days per month all multiplied x 2 (since 2 positions by days) I therefore lets you to calculate the turnover! NB in may 2016 tradeo already finished, not even a few months. THE TRADING SOCIAL it is an industry in full explosion that allows individuals with no experience of generating profits simply by copying all the profile of a trader on a trading platform social it is possible to analyze the behavior of an amateur trader who viewed these statistical and historical results and behaviours of trader. Social Trading is currently regarded as a method of diversifying its revenues in the modern era of the Internet with or without experience. Editor's Note: Do not confuse air ('atmosphere', 'gas', 'allure' or 'song') and era ("time"). EXAMPLE of COMMISSIONS S BoomDirect opens a market position GPB/USD position starts at S BoomDirect WINS 40% of the commission + $0.16 •, but who paid this commission in the end? HOW the TRADER BOOMDIRECT generated the PROFITS BOOMDIRECT the objective of the BoomDirect trader is to open several positions per day pickups so the gain is not the main objective. Most traders will tell everyone the same thing: what is the biggest challenge of a trader? It is to generate earnings and cash them at the right time. Many live all simply a very bad adventure or experience. All traders earn and lose every day, the goal is to generate more gains than losses. THE strategy of the BOOMDIRECT TRADER when the objective is not to create gains, trading activity becomes much more simple and safe. The mission of the BoomDirect trader is to monetize the loss of S then the task becomes much easier, because the goal is not to create a profit, but profit loss or create a small gain when possible and as the market permits. S with the fluctuations in the market (Editor's notes to fluctuations, it is packed full of mistakes), the trader is able to analyze the market and take position at the right time according to the curves and trends. These analyses recover the loss which was the basis a commission amputated in the open position. COMMISSIONS on the 'SPREAD' the 'spread' is the commission that trading platforms are gaining a position in the market opening. Contrary to what most people may believe, trading platforms do not earn their income on your gains or losses. Whenever an individual takes a purchase/sale position on the market, the trading platform takes an instant commission (ED it y a N not both). That's why when this position is underway, it starts with a negative, this negative is the commission cashed (Editor's note tired to all correct in what I take, no here I quit) by the trading platform. On these amounts boomdirect reverse as a first step, 1 time per month and then in term 2 times per month, at least 75% of the revenue generated to the members according to their rank. With BoomDirect, you get your pay every month. Indeed, a payroll, including your commissions according to your rank of positioning, your sponsorship commissions and your bonus is transferred into your account the first day of the month, and every month! There are only two conditions to be met to receive your pay: you must be a member called BoomDirect and have a balance of more than $10 in commission in your account. BoomDirect gives you the opportunity to reach your personal and financial goals. In all, it is a minimum of 75% of the overall profits of the company which are distributed to the members. Already several million dollars have been paid in commission. and the more our monthly annuity. and as the number of accounts Tradeo increases. BoomDirect collects commissions on the part of Tradeo for each trade, each position open and closed, that the trade either winner or loser, this is the strength of this partnership. Basically, more there will be members in BoomDirect and more monthly annuities will be high for all. Boomdirect accepts the most popular payment processors: Payza, Solid Trust Pay, Neteller, Perfect money and Bitcoin. • The removal system will be automated system gains and withdrawal, no need to make a withdrawal request and transfer date will be the same for all. S you will have the possibility to configure your removal system. S the information where to drop off your winnings S the payout percentage you want to withdraw each month S the payout percentage you want to reinvest in your rank advancement S the payout percentage you want to transfer Tradeo. S Commission S example 70% bi-monthly automatic withdrawal / 20% progress of rank / 10% investment Tradeo. Officially all investments made by members are used to sell products. Each week the sale of its products report money to BoomDirect. For example BoomDirect will have managed to sell 1000 anti virus from Kapersky €50 the unit. BoomDirect has therefore earned € 50,000, which will be redistributed to all those who have purchased coupons. So the gains of coupons vary from one week to another following the sales made by the company. More sales, better it will be for the members. And vice versa of course. It is possible to withdraw your winnings at any time. The minimum withdrawal is $ 50. The week of 6% interest is 310% annual (I take the information of the members as the basis for calculation), knowing that the best stock investments provide about 5% annual, that j´arrive up to 20% and not without risk… then 310 c´est just impossible. Imagine if you put €10,000 and at the end of l´annee you * 3 i.e. € 30,000 and this seems normal to you? Not there is always a scam! A totally Utopian yield of more than 6% per week gives, depending on the mode of calculation, 6 * 52 weeks 312% annual removing interest weekly (the output is displayed on the site, but it varies depending on the source), I advise you to ask your banker or directly to the relevant authorities what they say (the AMF telephone savings Info Service (: 01 53 45 62 00). In addition, leaving the interests generated interests is therefore multiplied the initial amount of € 1 per 1.06% power 52 (geometric continued) was an annual return of 2 000% (compound interest), let's be serious. To the fact how is calculated the interest at boomdirect? I am not even sure of the method of calculating them. Not clear it all, mature packs – they awhile until a sum? Are interests simple or composite on these packs? Brief eel under rock. Ed me when my calculation I find €7.9 monthly/50€ = 15% monthly package price either 1512 = 190% annual simple interest or if it reinvests with the formula of the suites geometric 1(1+0,15) 12 = 535% power, but the result does not change much in the end, it is utopian. All for the most basic package! Without any risk and life? Impossible. Moreover, in France the imprint say rather this "past performance does not guarantee necessarily upcoming performance. An investment in funds has risks, including the risk of capital loss. The value of an investment is subject to market fluctuations, and may therefore vary both the downward and upward. Therefore, purchasers of the funds may lose all or part of their capital originally invested." Proposed performance is clearly utopian compared to serious offers. Less than about bet in the actions of emerging markets within 10 years, clients should not rely on a yield exceeding 10% for their portfolios. Bonds will suffer capital losses, which will undermine their performance and actions should save an average yield of 7.5%. A diversified portfolio should offer an average annual return of 5% to 7% over the next decade. And with the new system, it enters the total delirium. 23.5/50 = 47% monthly, delirium. "You can for more information, contact the ARPP (authority of professional regulation of advertising, www.arpp-pub.org). For more information on sponsorship and pyramid systems, I invite you to read the specifications drafted by the Finance for all: http://www.lafinancepourtous.com/Decryptages/Articles/Systeme-de-vente-pyramidale so to contact the DGCCRF (General Directorate of e competition and consumption) at 3939. Also, be aware that these practices are regulated by article Article L122-6 of the code of consumption. Therefore, we invite you to be very careful with the BOOMDIRECT company. AMF savings service info *. * AMF Epargne info service makes every effort to provide high quality responses to your questions and provide you with the information being sought. These answers in any way constitute legal advice"
The authority of financial markets (AMF) attracts the attention of the public on the activities of the company GET EASY on the french territory. Society GET EASY (www.geteasygroup.com), whose headquarters would be located at 20/F, AIA Tower, 251-A – 301, Av Comercial de Macau, Macau, offers french investors, with an assumed monthly income guaranteed 100% for 12 months, to finance its activity which involves to make available to its customers from the geolocators. This remuneration is presented as that can be augmented by bonuses related to sponsorship. http://www.AMF-France.org or contact AMF savings info service 01 53 45 62 00 from Monday to Friday from 9 h to 17 h.
As a result many issues of savers, AMF indicate that GET EASY receives authorization to exercise an activity regulated by the AMF on the french territory. The AMF recommends that investors do not give response to the demands of society GET EASY and do not relay them to third parties, in any form whatsoever. No commercial speech must make you forget that there is no performance without high risk. To ensure that the intermediary who offers products or financial services is allowed to operate in France, you can consult the list of service providers for eligible investment (https://www.regafi.fr) or the list of permitted in category Advisor investment financial (CIF) or equity investments (PAC) (https://www.orias.fr/search) Advisor. If the person is on any of these lists, we strongly invite you to not respond to his requests. In response to your request, we send you the requested information. The site www.myboomdirect.net (ed. disabled link) is not and has never been registered with the authority of financial markets. This site is not allowed to solicit investors in Quebec. Before investing, it is essential to confirm the registration of the person or company that you have targeted public registry of the authority. In case you or one of your loved ones think of having been wronged, or else have detected the illegal solicitation, we invite you to fill out the denunciation form provided for this purpose. If you have any other questions, please feel free to contact the information Centre at the numbers listed below, or visit our web site. The information contained in this post are of general scope. They do not constitute legal advice to any person and shall not be interpreted as such. Therefore, you should consult your own acted as counsel in the legal consequences applicable to your particular situation. These information do not bind the authority of financial markets. So it is still forbidden. There we do have advertising for non-Quebec? Suddenly a €25, a blow to 50 pack, then a pack that mature at 140%, suddenly a lifetime income, then with tradeo counterbalances on everything, in short it smells not good, it is not stable. Yes more and more big especially. A system based on growth. We deal directly with the financial markets and in the best possible conditions. It was not good hard to find. costs 25, good tip. Withdrawal charge d? $ 25 will be deducted from the total of your balance. Please confirm your agreement to a withdrawal, the amount taken into account for these charges. Getting paid to almost do nothing? How be paid monthly in the new BoomDirect plan? 3 – Make a minimum deposit of $50 on Tradeo and copy the "Corporate BoomDirect" BoomDirect Trading profile. ER it's foutage of mouth at this level not just? I make a cheque and I am paid to life? Humor but this looks, non? And just after we must learn to traider? A good top three seconds ago told me there nothing to do. Damn I understand 😉 I thought that it was enough to make his cheque and that I have nothing to do. 40000membres * 7, €5 = € 300000 to give Member by me in a blank row. Boom redistributes 75% of performance and that this represents 40% of the partnership with tradeo was 525 000 / 0.75 0.4 = €1 750 000 per month just for the pension system that tradeo shall provide to boom. good they say have brewed 20million, why not? I think has a cancellation of debt operation by refusing to pay for not having to get out of cash because they have run out. It will get paid, but later. Martin, ben Yes just the most common name in France (the French are gifted in finance) and Johnny a name to US. There are dozens on google. on facebok he said live in Quebec, but he recorded as an administrator of the server in the USA. The facebook profile is old. 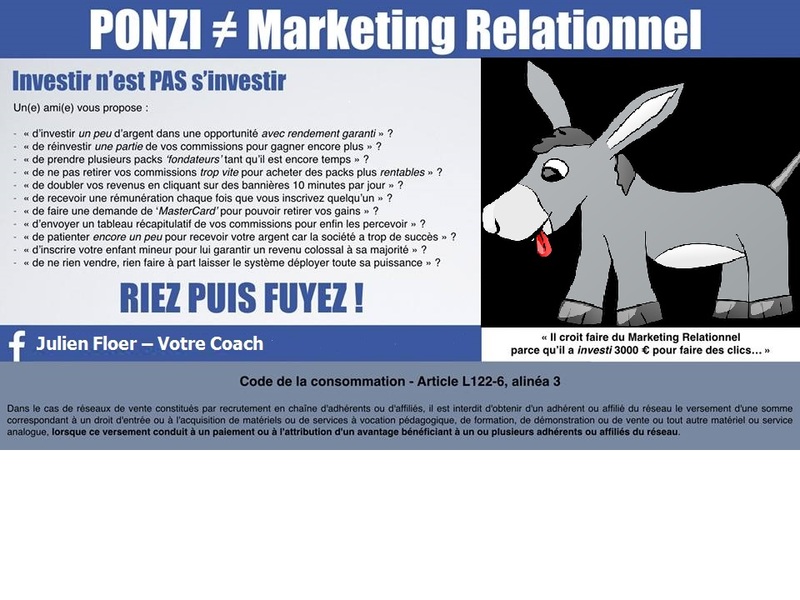 Boomdirect n´a not really economic model at hand sell obscure d´investissement packs. She says qu´elle sells antivirus, but the pay is not proportional to sales, but otherwise I can not find the topic on the site, because I want to buy one, too bad, still suspect something. As always l´utilisation systems doubtful for paying members. If you do not see the bank transfer, c´est for a simple reason, banks n´acceptent not turning against of l´argent Crooks, Tracfin which ensures grain there. With bank transfer must be a name and l´escroc do not want to know his real name. He n y no labels of control of the authorities, yet not very difficult to imitate for a forger, but very difficult to actually achieve. I am sure that the owner doesn't know even not. Note: the site is in french, you can ask the amf if they are registered, they are of course not. Therefore offer products at the French is already a mistake. The blabla on trading makes dream the most gullible, but in fact it just serves to hide the Ponzi scheme. A record in a tax haven ex address. The members said that the boom was in canada, yet this is not what is on the site. At the time of its recording, direct boom was officially in a non-cooperative tax haven, but since December that it is. In any case, it is by for nothing that they are gone in a tax haven, probably to go with the caisse. Unfortunately they should not think that the State is more cooperative than expected. This does not mean that it is clean so far. Besides the amf in quebec says it all. The site www.myboomdirect.net is not and has never been registered with the authority of financial markets. This site is not allowed to solicit investors in Quebec. Before investing, it is essential to confirm the registration of the person or company that you have targeted public registry of the authority. And vas y that they sponsor for direct boom located in… a tax haven. Yeah guys, going to review your copy. Of the imprint probably not legal. I am certainly not a lawyer, but when watching it makes me jump. The first thing that direct boom did what is not to provide the service, but exclude its liability. In any case I am sure that it should not be legal. It is the loser of a trial that paid counsel for the winner. You acknowledge and expressly agree that you use this site at your own risk only. You agree to defend, indemnify and hold harmless Boomdirect and societies members of his group as well as their directors, officers, trustees and respective employees in relation to obligations, costs and expenses, including reasonable attorney's fees, relating to a breach of these conditions by you or users of your account or arising in any way from the use of this site , including, but not limited to the posting or transmitting of information or elements on this site by you or users of your account. You agree that the fees and disbursements extrajudicial incurred during a lawsuit against BOOMDIRECT will be borne in full by the Member initiating such prosecution. He cannot claim these amounts to Boomdirect. In case of litigation the Court of British Virgin Islands is assigned to hear both parties. However the part on the Islands is correct, the shot person is going to do a trial for € 500, attorneys ' fees would be too high, clever. I did not yet have time to fix everything, yet they have about 100 times more resources than me, a glance of "antidote"(le logiciel de correction) just..,. Did you actually understand the economic model? Not to mention the many changes of packs or a communication misunderstood by members… (according to sources that differ greatly). I did not have official confirmation of serious partners. The partners of the advertising. January 2015 to December 2015, BoomDirect functioned as a traditional advertising agency in which we invest in advertising spaces dedicated to advertisers private society. In one year, almost 40,000 members have joined BoomDirect and nearly $10,000,000 was invested by members. In 1 year, BoomDirect is placed among the best opportunities of the internet. Since the month of January 2016, BoomDirect has decided to offer all members even more interesting remuneration and above all, more durable in time by stopping its partnership with its advertisers and allying the social trading power, and more specifically with society Tradeo, leader on this market. The concept is very simple, but also very rewarding: members are paid every 2 weeks a way on all the commissions generated by Tradeo (spread) and which are transferred to 40 per cent to BoomDirect. The contract signed with Tradeo is 5 years, which is supposed to ensure a continuity in the company and a secure and sustainable income to members. For the sake of improvement continues, and to perpetuate its activity, a unique partnership was signed for a period of 5 years between BoomDirect and the trading Tradeo platform. Don't worry: no special knowledge in trading is necessary, experts take care of everything, for members it's totally passive (connecting once a week to see his balance, it is sufficient). The new plan is extremely well thought on the part of the CEO Mr Martin. 100% of the members of BoomDirect to open an account on the site partner Tradeo via the back-office BoomDirect. In our interests at all because most will be many registrants on the Tradeo platform and more our monthly pension will be high. Because the new compensation plan BoomDirect will be more powerful that will increase the number of accounts Tradeo. may 2016: direct Boom changes again of main partner, Fxglobe which is registered in Cyprus, still not terrible, but better. comment very relevant on netbusinessrating and probably ironic is the 5th version of BoomDirect and 3rd platform! When the next? Except that in me trader to pay commission to intermediaries no money reports me. When direct boom really earns money? When pay you the packs when tradeo gives a Board of registration. and you in packs, bonuses, but revenues from boomdirect are paid by you somewhere. Good in all this it is really opaque and home business model is not in favour of the final customer. may 2016: Fxglobe which is registered in Cyprus (not really recognized to be a transparent financial place), yet not terrible, but better. Except that Bomm direct to so do scams before one legal thing does not erase what they have done. Initially, Tradeo is not a broker. There is content to be a social network that forged partnerships with brokers such as AvaTrade or Forex.com. That is the business model of Tradeo. Seen from the consumer, Tradeo is presented as a social network specializing in trading. Viewed from the side of Tradeo, it is actually an abnormal banner advertising which does not say his name and whose ultimate goal is, again and again, to convince its members to open a trading among its partners account and place money. In this, Tradeo is just a very, very big business provider as there are many others, who will receive a percentage on each euro invested and no doubt lost thanks to him. These are therefore thousands of euros that pass Pocket Tradeo members on Tradeo accounts without first knowing necessarily. Average life of the portfolio of an investor in this type of market is only 90 days. Tradeo is therefore engaged in a permanent race to new customers to keep its volume of trades and generate the turnover. The number of customers has not been at the venue and in many forums, can be read with a lot of recoil of the rather negative comments. In our opinion, these are the reasons why Tradeo had to review its model and become a broker himself. Early 2014, Tradeo becomes a broker. Posing as broker STP, it allows to open an account directly on its Portal. It remains the sole representative of its customer support to retain. Communication campaigns have flocked around to introduce this new concept that brings a quite revolutionary digital sharing offer. Found even today in La Tribune + boursorama, very serious economic journal, a first very advantageous position in the list of recommended Brokers. Far ahead the best known. As part of their innovative solution, they have also been featured on TechCrunch, Mashable, CNBC and Reuters. Caution these are items partners, they are not made by the tribune. They are distributed through money to the rostrum. As soon as you look more closely, Tradeo resembles a typical opaque structure of the financial arrangements of unscrupulous brokers. On its bonds of Brokerage services, Tradeo presents itself first as a brand belonging to the HOGG CAPITAL group, a company regulated in Malta and offering the Trading TIER 1FX platform. Then, oddly, he presents himself as partner. We learn later that HOGG CAPITAL has been replaced by a new broker called FXGLOBE, regulated in Cyprus, he presents as his partner. Autre fait suspect, sur leur site internet www.tradeo.com, aucune mention ou identification n'est faite de la société détenant la marque Tradeo. It is by searching on their site dedicated to affiliates that we find mention of a membership in a society: MARKETBOOKS LTD. IN any case this company is not registered in FRANCE as a licensed broker. Tradeo practice a commercial solicitation that the apparent less honest brokers. Investors are canvassed without having requested it. The discourse of sellers is misleading and insistent. We identified numerous complaints of former clients who complain of the business method of Tradeo and who found themselves with an account to zero. We are probably dealing with a team of professionals of manipulation as we met often in this industry. The originality of Tradeo, it is his 'social network', which resembles especially in a developed system in confidence of the victim, who will have little recourse if she finally discovers the deception. Tradeo claims that his remuneration is based only on the volume of transactions. But the above encourages us to ask ourselves if Tradeo does not retrieve everything its customers lose on its platform. Why Tradeo grows all its customers to invest still more money? Above all, why Tradeo offers management for account of third parties or the Council through their Trader SIMON AZOULAY? Tradeo has for this authorization. If we assume that Tradeo clients losses are Tradeo gains, all lights. If this conflict of interest is proven, we can only amaze us that Tradeo hides behind a license to a third party that allows him to exercise legally in Europe based in Israel. Would Tradeo place not on the black list of the AMF? Communication campaigns have flocked around to introduce this new concept that brings a quite revolutionary digital sharing offer. Found even today in La Tribune, very serious economic journal, a first very advantageous position in the list of recommended Brokers. Far ahead the best known. As part of their innovative solution, they have also been featured on TechCrunch, Mashable, CNBC and Reuters. IP Location -Arizona – Phoenix – Cloudflare Inc.
As suggests well the http://stopmensonges.com/ site, when you ride a company, the first thing to do is to give credit by posting publicly partners and clients that you start to sign. An advertising agency has one side of the partners (suppliers, as shown on the site, coca coca insane work with be it push) which are the websites with which you sign agreements to manage and sell their advertising, and on the other locations listed you have customers you sign (the advertisers). On average, a bank will take you between 5 and 9% interest rate. Can be more. Red sites that sponsor those who say that it is a scam in green and white the neutral. http://Rue89.nouvelobs.com/2015/10/12/profits25-meoclick-boomdirect-feriez-Mieux-fuir-sites-261617 in fact the only "big newspaper" which talks about not said that ill of boomdirect, he made it clear that it is a scam. The lack or absence of means of communication of these advertising networks is not the only fly in the ointment. As Jay, many users fail to touch the money they theoretically won. Whence the money? In general these sites urge to «recruit» with links by sponsorship system. This kind of method, if you clearly do not know whence your profits, it is signed 'Ponzi scheme '. Then some people are clearly aware, and the goal is to get out before the pyramid collapses. This is called the surfing Ponzi. A Ponzi scheme is untenable because it must increase revenues exponentially. Finally in short, these sites are just disguised ponzis simply. "Given the lack of communication, which complain on social networks many Internet users, who fear have fallen in a pyramid scheme"
Just by reading the beginning of the article you could feel the sting, installation of this kind of business is quite a pyramid scheme where the gogo is attracted by windfall gains and does not see the crook who hides behind, but good it will not remake the human species, there are always pigeons and vultures. So yes must punish the wicked. But for that you have the Rivrins? We are mostly publiphobes, and in all cases are nor covetous, nor after the gai[*]n, these warnings are therefore moot and even offensive towards us! Reminder: The ponzis pay always, at the beginning at least and close after a certain time. A Ponzi pyramid claimed 300 000 lives in the world, Get Easy Portuguese society for example. As you can see, there are more drawbacks than d´avantages to attempt an "investment".